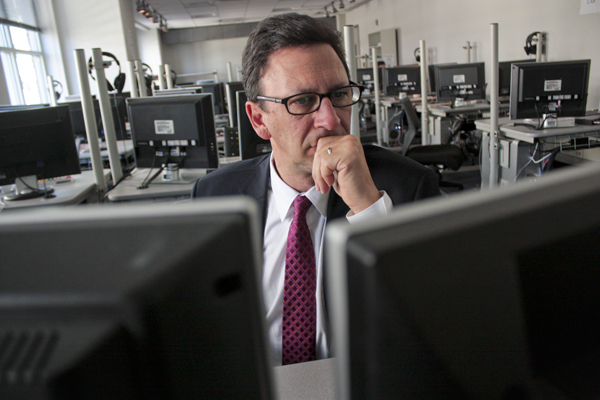 Director of the School of Media and Public Affairs Frank Sesno studies a computer screen in the school's digital media lab. Sesno wants to incorporate more data visualization and multimedia into existing SMPA classes and potentially add some courses after faculty discuss changes this summer. As journalists adapt to changing digital practices, the School of Media and Public Affairs’ top leader said the journalism school faces plenty of hurdles to keep up. SMPA faculty will begin sketching a plan for the school’s next five years this summer, and will be looking to incorporate data visualization and more multimedia skills into classes. But change, Sesno said, will likely come gradually even as journalism students step into a rapidly changing field. The school will continue to hire faculty from the field to bring current trends into classes instead of big curricular shifts, the director said. “When you’re in an environment where things are moving at warp speed, and you are used to moving at semester speed, that can be a challenge,” Sesno said earlier this year. This summer’s discussions will focus on long-term goals and will call on the school’s faculty to highlight where they see possibility for change. Administrators also plan to consult with successful alumni to see how the current program has prepared students for jobs. The school last revised its core curriculum in 2006, when it added an introduction to digital media course, which teaches students shooting, editing and web skills. Curriculum shifts typically come slow at universities, where change often means paying up for new faculty and requiring faculty committees and top administrators to sign off. Sesno said the school will eventually look to arm students with the skills to analyze and visualize data as interactive graphics and charts change the way journalists tell stories online. That would likely spur the school to add classes, and potentially requirements, in topics surrounding data. The approach is far-removed from some of GW’s competitors, like New York University, which recently started offering a concentration in computational and digital journalism. Eric Newton, a senior adviser to the president of the Knight Foundation, a top journalism-funding organization, warned that universities that refuse to overhaul programs could lose out on top students and potential donors. He said journalism schools across the country are using outdated curricula that were created during the rise of mass media in the last century. Newton acknowledged that the constant change requires careful budgeting and can be risky when schools want to make the most of each dollar, but maintained that spending money properly can keep programs up to date. “Change is a risk. But a bigger risk in the digital age is not changing at all,” Newton said. With 24 adjunct faculty that taught 25 classes last spring, Sesno said SMPA depends on these professors to bring their real-world experience into the classroom and to teach students what is new in the industry. Many recent full-time hires, including three made last month, also have solid digital journalism backgrounds. And this fall, the class will start use Adobe editing tools, rather than Final Cut Pro, putting the school in line with major media outlets that use the newer software. One of the new hires, Imani Cheers, said the school needs to add data visualization classes to the curriculum, as jobs interpreting and preparing data are popping up across the industry. “Large and powerful media organizations are looking for recent college graduates who can put massive amounts of data together and visually, engagingly, and compellingly portray that. Those weren’t jobs a few years ago,” said Cheers, a former executive at PBS Newshour. This article appeared in the June 11, 2013 issue of the Hatchet.